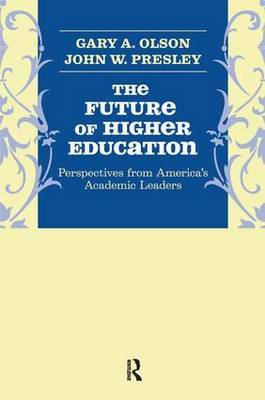 Written by leading education experts and by university presidents, provosts, and other leaders nationally recognized for their innovations, the 22 original and provocative chapters in this new book comprise a wide-ranging examination of the many challenges faced in fashioning the university of tomorrow. Authors offer their research, predictions, concerns, and advice on topics ranging from university finances, student access, changing technologies, and the philosophical underpinnings of college education. They address the multiple challenges facing higher education today, offering ideas and solutions. Contributors include Warren Arbogast, Gretchen Bataille, Lee Benson, Rita Bornstein , Sally Clausen , Reed Way Dasenbrock, John A. Dossey, Jean Dowdall, James L. Fisher, Judy L. Genshaft , Henry A. Giroux, Ira Harkavy , Michael Hoad, Freeman A. Hrabowski, Stephen K. Klasko, James V. Koch, George Mehaffy , J. Hillis Miller, Gary A. Olson , John W. Presley, John Puckett , Michael Rao, Charles B. Reed, Rollin C. Richmond, Roseann Runte, Neil J. Smelser , Sheila M. Stearns, and Randy L. Swing.